Humboldt Baykeeper has been following Caltrans' Eureka-Arcata 101 Corridor Safety Improvement Project since 2007, when the Draft Environmental Impact Report was released. 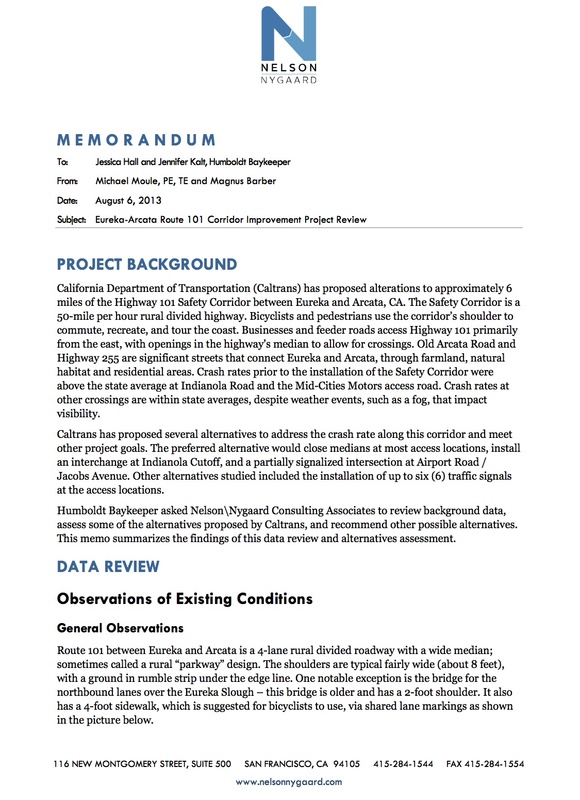 Caltrans proposes to improve safety along this 8-mile stretch of highway adjacent to the Humboldt Bay shoreline between Arcata and Eureka. In preparation for the upcoming state Coastal Commission hearing on the Arcata-Eureka 101 Corridor Project, the Board of Supervisors will vote Tuesday on which members will speak for the county. According to a county report, the board is requesting that 3rd District Supervisor Mark Lovelace and 4th District Supervisor Virginia Bass — who represent Arcata and Eureka, respectively — present a letter supporting a pedestrian-bike trail connecting the cities at the federal consistency hearing on Thursday at the Wharfinger Building. Humbol dt Baykeeper commissioned an independent review of the 101 Corridor Improvement Project by Michael Moule, PE and TE, and Magnus Barber of Nelson\Nygaard Consulting Associates, Inc. Moule specializes in improving conditions for non-motorized users without degrading motor vehicle capacity and balancing the needs of all users within the public right of way.